Utilizing the OMNI Board 2.2 chipset, the Vaporesso Revenger X 220W TC Kit has touch screen controls and innovation that paves the way for a more intuitive future. The Revenger X Mod consists of In-Mould Labeling and Aluminum Alloy shaped to dimensions of 45mm x 89mm x 28mm. The only physical button on the mod is the oversized firing button while all other mechanical buttons have been integrated into the screen as three responsive touch buttons. Much like your phone, these touch buttons provide a customizable haptic vibration when pressed to indicate you are actually adjusting things. The 0.96 inch OLED screen displays output mode, vaping effect, voltage, resistance, individual battery life indicators, and a puff counter. 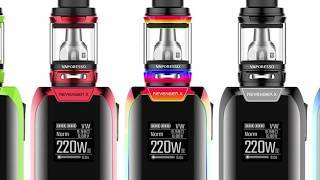 The Revenger X has several output modes including VW, CCW, CCT, TC, TCR, and Bypass mode, offering a wide range of customizable settings for beginners and seasoned vapers alike. Variable Wattage mode allows you to choose wattages from 5 to 220W and you can set your desired vaping effect to High, Normal, or Soft. Temperature Control allows for temperatures between 200-600F (100-315C) while providing compatibility with Nickel, Titanium, and Stainless Steel heating elements. For more advanced settings, embark into CCW and CCT modes to customize your vaping experience down to the last detail. For your convenience, Vaporesso has given this mod two memory modes so you don’t have to go through the trouble of readjusting your settings every time you vape. When your done customizing your output modes and the mod is idle for a moment, the display screen shows a real time clock. The OMNI Board 2.2 chipset is powered by spring loaded dual 18650 batteries (not included) that are installed through a magnetic battery access door. This powerful chipset not only allows for such a wide range of output modes but also gives the mod a start up speed of less than 0.1s. To charge the Revenger X and install firmware upgrades, utilize the Micro-USB port near the base of the mod. Alongside the 2.5A quick charging capability, the display screen will notify you of how much more time it will take to fully charge. The Revenger X has smart atomizer recognition that will automatically recommend the ideal resistance for the installed coil head. Other safety features for this mod include low voltage, short circuit, low resistance, overheating, and time out protection. Attached to the center mounted threaded 510 connection is Vaporesso’s new NRG Tank with powerful GT cores and a user-friendly top-filling method. This tank is composed of superior Stainless Steel and durable Pyrex glass standing at 56mm with a diameter of 26.5mm. On top of the tank is a standard 810 wide-bore drip tip that provides increased airflow. If you prefer 510 drip tips, Vaporesso has provided a 510 drip tip adapter in the packaging. For your safety and convenience, Vaporesso has installed a thin heat insulation layer just below the top cap, keeping too much heat from getting to your lips. To fill the NRG Tank, push the top cap as indicated, then twist it open to expose the large fill port. Simply drop in an entire 5mL of your favorite e-liquid into the glass reservoir and experience the bold power of Vaporesso’s GT core coil heads. Pre-installed is a 0.15 ohm GT8 core coil head with vertically-oriented quad cylinders rated for use at 50-110W but is recommended at 60-80W. Included with this kit is the 0.35 ohm GT4 dual cylinder coil head rated for use at 30-70W but is recommended for best use at 45-60W. Along the base of the tank air two large bottom adjustable airflow slots that can be fully closed to fully open, offering up complete airflow control. The powerful NRG Tank and the Revenger X Mod make for an unstoppable duo in the name of innovation. Experience class, sophistication, and unprecedented technology with the all new Vaporesso Revenger X Starter Kit.